This looks wonderful! Thank you so much for sharing this and for providing a bread machine option, too. I work full time (from home), and having bread machine recipes makes it easier for me to make my own bread. This looks wonderful. Thank you for sharing it. I love all of your recipes you have posted here. You are so welcome! Glad you have enjoyed them. I dont think i can buy dried minced onion here, could i sub saute finely chopped onion. If so how much fresh onion. Thank you for including the “hand” instruction as I do not have a bread machine! 🙂 Looks incredible!! 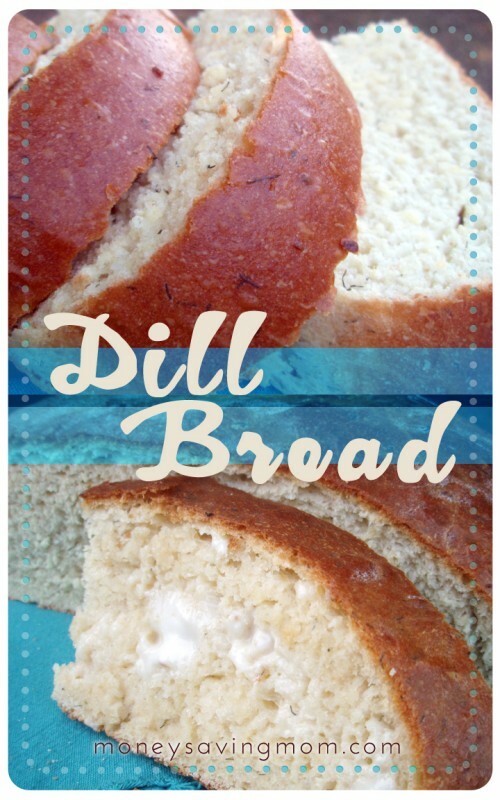 I don’t know if I ever had dill bread but I would like to try it. Thanks also for the hand method because that is how I make my bread also. Just came on looking for a bread recipe to go with our dinner tonight – and here is a new one; perfect timing! It is mixing in my bread machine now, I can’t wait to try it! I didn’t even finish reading the post…I printed out the recipe and it’s in the bread machine now. 🙂 I have pea soup cooking on the stove and this sounded like the perfect bread to complement it! Thanks for posting! Yum! I want to eat at your house tonight! Do you use fresh dill or dried dill? I’m going to try making this bread tomorrow! I use dried. Fresh would probably work, but you would have to google it to see how much fresh dill = 1 1/2 teaspoons dried. Sounds delicious. Going to put it on my list to make. Could you just continue to bake this in your bread machine or is it recommended to remove it and bake it in a regular oven? I can’t say since I haven’t tried it. If your bread machine is able to bake a loaf with 4+ cups flour using other recipes, then it would probably work. My personal experience with actually baking bread – any recipe – in my machine, is that it turns out drier than the same recipe in the oven. (I’ve tried taking it out sooner, and then it is usually unevenly cooked. )I’ve experimented with both a cheap bread machine and an expensive one, and never achieved “perfection.” 🙂 However, if you have had good success with baking bread in your machine, there’s no reason why this recipe shouldn’t work! I accidentally used bread flour. :(. It’s mixing in my bread machine right now… Will it turn out okay? Well, you already know the answer to this by now :), but I’m guessing it turned out just fine! Tried it and loved it! 5 thumbs up in our house (out of 5)! But, please note that this makes one seriously large loaf of bread! I made it baguette/french shaped to easier make sandwiches with later. Wish I had made 2 loaves instead. Could have easily shared one with a friend. I will use the leftover bread to make croutons though, so it will get put to good use! Will definitely make again! Thanks for the recipe! Glad it was a winner! You’re right about the loaf being seriously large… you have to remember that I come from a family of 9 – so when I say “one large loaf,” I should probably further clarify that for the average American. 🙂 Ha! Croutons would be fabulous. It also freezes well, which is often what I do now – cut it in half and freeze half. Two loaves is a good idea, although I’m guessing they would cook in less time. Made this and it’s so good. I was planning on making grilled cheese and it just crumbled when I tried to cut it. Any suggestions? Hmmm…mine doesn’t crumble. Maybe it got overcooked? Is it fresh out of the oven or has it sat overnight? You could always try freezing it for 30 minutes or so before cutting it to see if that helps it hold its shape better. I made this to go with Tortellini Soup and it was delicious. I agree with the other poster who said it yielded a very large loaf. I had a crowd of 10 people and we were able to eat it all, but in the future (for my family of 3) I’ll probably do two smaller loafs and give one away. Thanks for the yummy recipe! You can also freeze one of the loaves (or just cut the one large loaf in half, and freeze half of it – which is what I do for our family right now). Thank you so much for sharing this recipe Brigette. I made it tonight and it is delicious. I split it into two loaves as suggested below and will send one loaf with my husband who will be gone for a few nights starting tomorrow (he can share it with his coworkers if he doesn’t think he can finish) and kept the other loaf for the kids and I to have with homemade soup tomorrow night. It is also good to know that it freezes well for future reference (for when my husband is going to be home and we won’t need the two loaves). This bread is delicious! I mixed 1/2 white 1/2 wheat flour and had the first rise using the DOUGH setting of my bread machine. For the 2nd rise, I transferred to a parchment covered baking sheet, covered with a clean drying cloth, and placed inside of my COLD oven so it would be free of drafts. IT WAS BEAUTIFUL and HUGE! I definitely WILL divide it into 2 loaves as suggested the next time I make it! I shared half of the loaf with neighbors and they loved it too! The texture and weight of this bread is so good I plan to use the dough as a base for plain wheat bread and other favors too! Thanks you for this easy and delicious recipe! Sounds delicious. I enjoy trying new bread recipes. My favorite is honey oatmeal bread. I find that you need to cut thicker slices with homemade bread when using it for sandwiches or toast. Hi, does anyone else find that the dill dough is a bit stiff? I’m having trouble getting it in my tin. Maybe I should use olive oil to help get the dill dough right the way in? Bridgett! I have been searching for four years to find this wonderful recipe. I bought a loaf from a small bakery about two hundred miles from my home and by the time I got to taste that fantastic loaf I was too far away. I went back to get more but they were closed. 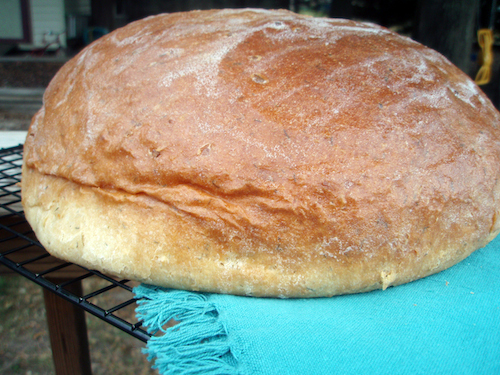 I made every recipe I came across for dill bread and none of them came close to that recipe or lived up to the taste of yours. It was difficult to find one that didn’t use cottage cheese. I think the key ingredient also is the dried onion. What a wonderful flavor! 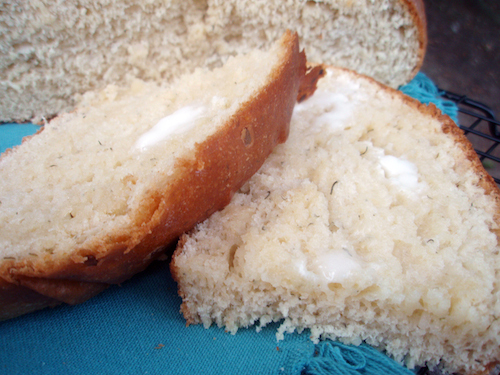 The first time I made this I took it over to my brother’s house and we ate the entire loaf! Thank you so very much. Yummy… I’m going to try your recipe in a few minutes using my bread machine… I can already smell it baking and taste how good it will be!